Warid Pakistan has announced its latest Sim Lagao Offer for the month of May & June 2012. This time Warid comes up with a refreshing SIM Jagao Offer with more value than ever before. 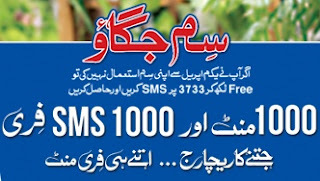 All those customers who have not used their Warid SIM since 1st April, 2012, can start using it now to receive 1,000 FREE on-net minutes and 1,000 SMS without any additional charges. Not only this, subscribers will also get 100% bonus on every recharge till the validity of this promotion. For every recharge between Rs. 50 - 500, customers will get FREE bonus minutes worth the amount of the recharge. In this way the greater the recharge amount, the bigger the bonus. These bonus minutes will only be eligible for free calls to all Warid numbers with free SMS to all local networks. Warid users can enjoy amazing call rates as low as Rs.3.99 per hour for all calls to FnF. No other network is offering such rewards, which makes this a unique opportunity indeed.